The Cylons launch a major strike against the fleet. 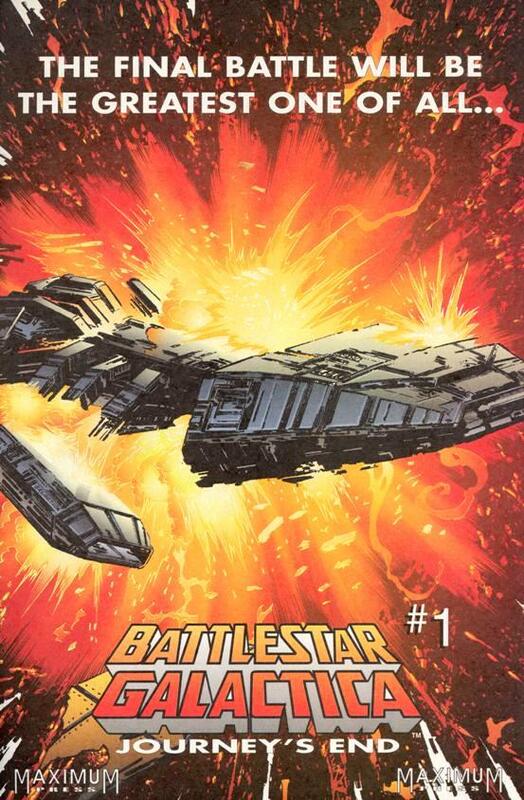 The cover of this issue depicts the Galactica (with the storyline's squatter, more armored look) exploding, but in the story it is actually the Pegasus (with the classic battlestar look) that is destroyed. 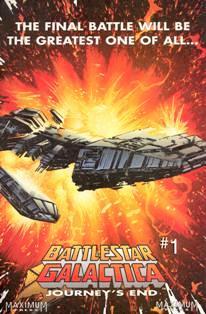 In the advertisements for this issue which appeared in other Maximum Press issues, a classic battlestar is depicted exploding. As this story opens, the Colonials are celebrating the Festival of the New Yahren. It is now the Colonial yahren 7363. This is the first mention of the Festival of the New Yahren in the BSG universe. On page 1, Commander Apollo records in his journal that the original celestial chamber of the Galactica was destroyed during a battle with the Cylons 7 yahrens ago. He had it rebuilt and he himself refers to it as the Hand of God, as he did in the episode "The Hand of God". The chamber as presented here is quite a bit larger than the one seen in the aforementioned episode; possibly Apollo simply ordered a larger version of the original constructed so more people could enjoy it at once, though here we see him alone with his thoughts. Page 2 reveals that Apollo has been mapping the stars as seen from Earth ever since the fleet arrived. On page 4, the Seraph Elias informs Apollo that Count Iblis has gathered his followers and struck at the heart of the Seraph continuum, bringing about a cosmic war of dark and light. On page 5, Adam reveals that his father, the chieftain of the Thirteenth Tribe, had charged he and Eve with the colonization of Earth. This, of course, is a touchstone with the Biblical story of Adam and Eve, who are said to have been created by God and later cursed with mortality, hard work, and childbirth after eating the fruit of the Tree of Knowledge. Elias tells the Earth Council, the newly-formed replacement for the Council of the Twelve (as revealed in "Apollo's Journey" Part 1), that the Colonials must flee Earth and never return in order to escape the Cylons. Adam and Eve feel they must stay behind in the ark, to colonize Earth. We get no further stories of Adam and Eve on Earth, but it seems reasonable to assume that the two began to have children and were inspired to name their first two sons, Cain and Abel, after Cain and Apollo ("Abel" could be considered an historical corruption of the name "Apollo"), though it would seem a bit odd that they would name there first son Cain instead of Apollo since it was Apollo whom Adam (particularly) and Eve were closest in friendship and respect. On page 7, Imperious Leader tells Baltar that Spectre has been deactivated for his failure to deliver the Cylon fleet to Earth (as seen in "Apollo's Journey" Part 3). He places Baltar in command of the Cylon fleet. 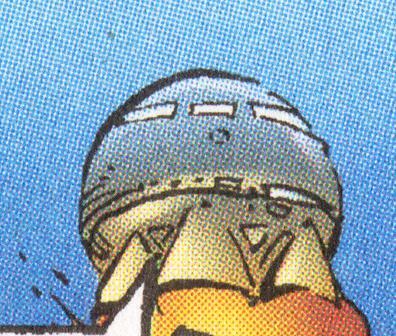 As the Colonials evacuate Earth on page 8, a pod launching in the background of panel 1 looks somewhat similar to the moon pod seen in the 1968 film 2001: A Space Odyssey. It's also possible the same pod ship is seen in Earth orbit on page 12. Also in panel 1 of page 8, notice there appears to be a daggit on a leash in the bottom left corner. Ever since "Exodus", it has been said that no real daggits exist in the fleet, so this one is presumably a wild Earth dog which has been captured or bred for domestic use. On pages 9-10, Starbuck is depicted as having survived his encounter with Ares after their escape pod came out of warp and crashed on a desert planet somewhere. This an homage to the "Return of Starbuck" episode of Galactica 1980, in which he is also depicted as having crash-landed on a desert planet he names after himself. 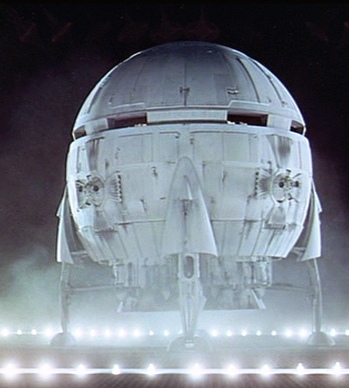 It seems a bit odd that a mere escape pod would have warp drive, but might be considered to have a short-term such capability for purposes of fleeing a space battle, as occurred in "The Enemy Within" Part 3. On page 9, notice that the desert planet has twin suns in the sky, perhaps a nod to the desert world of Tatooine in the Star Wars saga, which also has two suns. In panel 2 of page 9, notice that the "bucket" Starbuck uses to scoop water out of a hole in the ground is actually the head of a Cylon centurion. Presumably it is the head of Ares, who was revealed to have a modified centurion head under the false human flesh of his face when last seen locked in battle with Starbuck in "The Enemy Within" Part 3. On page 10, Starbuck muses that the most advanced life form he's found on the planet is a four-legged, scaly creature the size of a Caprican field rat. This is the first mention of such a field rat, so it doesn't do much to inform us of the creature's size, but it is presumably about the size of a modern wild Earth rat. "Journey's End" Part 2 depicts Starbuck hunting a small reptilian creature that looks similar to a Compsognathus dinosaur; possibly this is the creature he ruminates on here. As the Cylon Raiders ram the Pegasus, Apollo guesses from the size of the explosions that they must be packed with solenite. This is the same explosive used in several episodes of the TV series, notably in the same fashion as seen here by the Cylon Raiders that rammed the Galactica in "Fire in Space". On page 17, the unnamed civilian flag ship informs the Galactica that over half the fleet has been lost already in the battle. Later, on page 20, Athena reports that 137 civilian craft have been lost. The Pegasus is then destroyed as well. We've been told so many different and conflicting numbers of ships remaining in the fleet through the Hatch novels and the Maximum Press comics that there's no easy telling how many are left now. The most recent number we have was at the end of "War of Eden" Part 1, 162, but the Hatch novels stated even fewer (even as low as 30!). If we assume the 162 is correct in "War of Eden" Part 1, then only 25 ships remain. Possibly even more are destroyed by the Cylons after Elias warps the Galactica away from Earth. Of course, time travel is employed throughout this mini-series, so by the end of "Journey's End" Part 4, the fleet is more-or-less back to the way it was when this issue started. One of the ships reported lost in this battle is the Celestra II. Was this a replacement of the Celestra, which itself was reported to have taken heavy damage and was being abandoned after the Cylon battle in "War of Eden" Part 4? Or was the Celestra mentioned in that earlier issue also the Celestra II, spoken of in shorthand and later repaired on Earth? If so, what happened to the original Celestra, last mentioned as still existing in Armageddon? 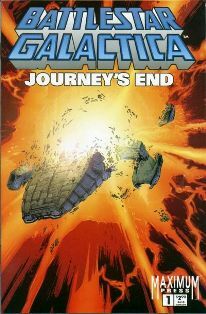 After escaping the battle at Earth and emerging from warp to find themselves in the future on page 23, a Galactica bridge officer refers to the unknown ships detected nearby as Class Delta ships, soon identified as Eastern Alliance destroyers. This is the first mention of Class Delta ships; presumably it is part of a Colonial system for describing ships of a certain size, weaponization, and/or life-sustaining capability. The fleet first encountered the Eastern Alliance forces of the planet Terra in "Greetings from Earth" Part 2 and last in "The Leiter Side of Life". Who are Count Iblis' followers in the war against the Seraphs in the continuum as mentioned by Elias? It's never revealed.